The day electricity first illuminated her grandmother's house on the Navajo reservation, Sandra Begay-Campbell (above right) drove her family across the New Mexico desert to see the porch light shining into the night. This miracle of electrification occurred in the 21st century, only two hours from Sandia National Laboratories, where the Stanford-trained engineer works with the Department of Energy's Tribal Energy Program. An estimated 19,000 Native households lack electricity--and the economic opportunities that accompany it. With the nearest transmission lines miles away, tapping into the grid remains too expensive. But as solar, wind, and biomass power become more efficient, Begay-Campbell sees a chance to bring clean energy to southwestern Native Americans. Begay-Campbell's renewable projects began small, helping with solar panels on remote homes, but sun-scorched, hard-to-farm lands turned out to be prime real estate for generating clean energy. The DOE estimates that 10,000 square miles of desert solar installations could meet U.S. electricity needs; Navajo lands are more than twice that size. 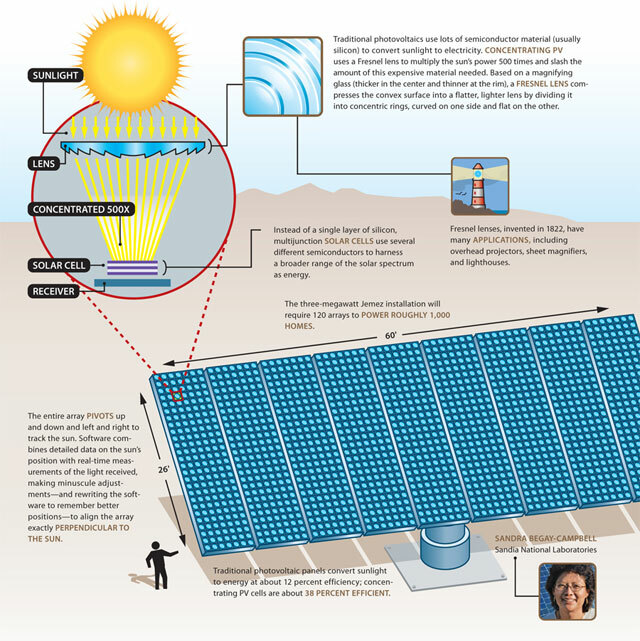 Begay-Campbell is working on a $17 million concentrating solar power installation on Jemez tribal lands. The pilot project, expected to break ground this year, will switch the tribe off coal and allow it to sell excess electricity onto the grid. Begay-Campbell and Native leaders hope such utility-scale solar projects will deliver both electric and economic power to their people. Web only! To read about other Native American renewable energy projects, visit Native Wind. And look for a Sierra Club Productions film on Native Wind due out in fall 2009. Infographic by Funnel Inc.; used with permission. Photo by Don Campbell Photography; used with permission.